(13) Where the members are not prepared for full contact in bearing, splice material should be provided to transmit the internal forces and moments in the member at the spliced section, including the moments due to applied eccentricity, initial imperfections and second-order deformations. The internal forces and moments should be taken as not less than a moment equal to 25% of the moment capacity of the weaker section about both axes and a shear force equal to 2.5% of the normal force capacity of the weaker section in the directions of both axes. (14) Where the members are prepared for full contact in bearing, splice material should be provided to transmit 25% of the maximum compressive force in the column. (15) The alignment of the abutting ends of members subjected to compression should be maintained by cover plates or other means. The splice material and its fastenings should be proportioned to carry forces at the abutting ends, acting in any direction perpendicular to the axis of the member. In the design of splices the second order effects should also be taken into account. - the proportion of moment, deformation or rotations carried by the web or part, irrespective of any shedding of stresses into adjoining parts assumed in the design of the member or part. Atf,Rd is the effective design tension resistance of bolt-row r ; hr is the distance from bolt-row r to the centre of compression; r is the bolt-row number. NOTE: In a bolted connection with more than one bolt-row in tension, the bolt-rows are numbered starting from the bolt-row farthest from the centre of compression. (2) For bolted end-plate connections, the centre of compression should be assumed to be in line with the centre of the compression flange of the connected member. (3) The effective design tension resistance AtrRd for each bolt-row should be determined in sequence, starting from bolt-row 1, the bolt-row farthest from the centre of compression, then progressing to bolt-row 2, etc. (4) When determining the value of AtfRd for bolt-row r the effective design tension resistance of all other bolt-rows closer to the centre of compression should be ignored. (5) The effective design tension resistance AtfRd of bolt-row r should be taken as its design tension resistance AtRd as an individual bolt-row determined from 6.2.7.2(6), reduced if necessary to satisfy the conditions specified in 6.2.7.2(7), (8) and (9). - the design resistance of the beam flange and web in compression Ac, fb,Rd - see 6.2.6.7.
x is the bolt-row farthest from the centre of compression that has a design tension resistance greater than 1,9 At, Rd . NOTE: The National Annex may give other situations where equation (6.26) is relevant. 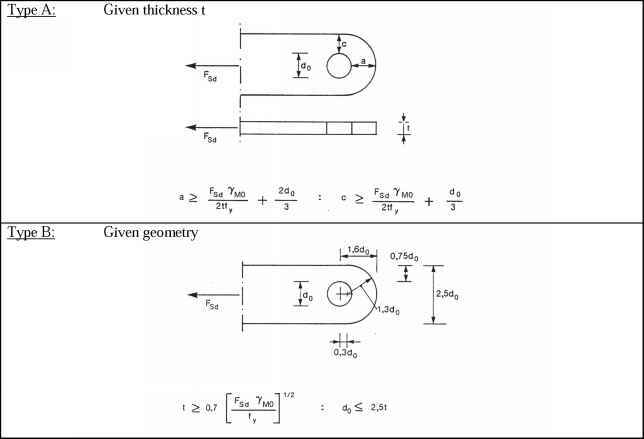 (10) The method described in 6.2.7.2(1) to 6.2.7.2(9) may be applied to a bolted beam splice with welded end-plates, see Figure 6.17, by omitting the items relating to the column. (1) Column bases should be of sufficient size, stiffness and strength to transmit the axial forces, bending moments and shear forces in columns to their foundations or other supports without exceeding the load carrying capacity of these supports. (2) The design bearing strength between the base plate and its support may be determined on the basis of a uniform distribution of compressive force over the bearing area. For concrete foundations the bearing strength should not exceed the design bearing strength, fd , given in 6.2.5(7). - In the case of a dominant compressive axial force, full compression may develop under both column flanges as shown in Figure 6.18(a). - In the case of a dominant tensile force, full tension may develop under both flanges as shown in Figure 6.18(b). - In the case of a dominant bending moment compression may develop under one column flange and tension under the other as shown in Figure 6.18(c) and Figure 6.18(d). (4) Base plates should be designed using the appropriate methods given in 6.2.8.2 and 6.2.8.3. - Frictional design resistance at the joint between the base plate and its support. - The design shear resistance of the anchor bolts. - The design shear resistance of the surrounding part of the foundation. If anchor bolts are used to resist the shear forces between the base plate and its support, rupture of the concrete in bearing should also be checked, according to EN 1992. Where the above methods are inadequate special elements such as blocks or bar shear connectors should be used to transfer the shear forces between the base plate and its support. How to calculate lever arm in column splice? How to derived the design lever arm?